Enhance your Oral Care Experience with These 5 Dental Apps (Infographic) - Diane W. Sherman, D.M.D. How much fun do you have while brushing your teeth? If you view oral care as an arduous experience, you may not be brushing as often as you should. Fortunately, anyone with a smartphone can download a variety of dental apps that make brushing and flossing a more fun and interesting experience. While the quintessential tools for oral care are simple, the ways that advanced technology can aid dental care are becoming more prevalent. From electric toothbrushes and water flossers to smartphone dental apps that provide info and innovative features for patients, technology is providing powerful tools that can affect your oral care. In the case of smartphone apps, many of them are free, so the benefits are more approachable than ever. Since 61% of Americans own a smartphone, apps are an innovative digital tool used by millions of people. Whether you’re running a business, managing contacts, or just wasting time, there is an app that’s perfect for your needs. Dental apps are no different. Dozens of dental apps seek to revolutionize a particular aspect of the oral care process. 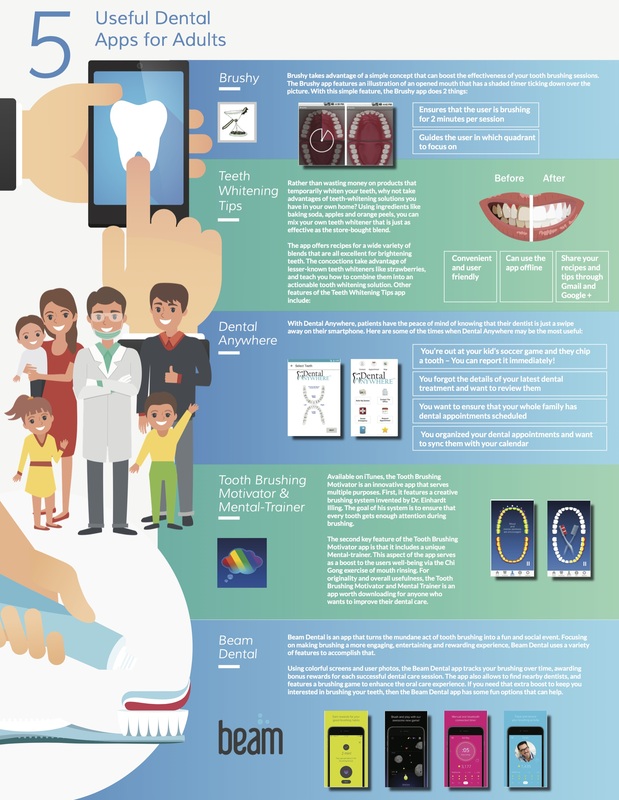 From adding fun to the experience to providing a handheld encyclopedia of dental knowledge, consider these dental apps to boost your oral care experience. For a dental app that is simple yet effective, Brushy can guide you through your brushing sessions. Featuring a timer and an animation of a mouth, Brushy runs a timer that cycles you through the 4 quadrants of the mouth. This means you can follow along with the app, ensuring that you’ve spent sufficient time on each part of your mouth. Although Brushy is a simple concept, it can be a free and valuable tool for keeping your oral hygiene sessions accurate and effective. Do you know any common household products that can brighten your teeth by a few shades? You will after trying the Teeth Whitening Tips app, a useful app for anyone who wants to save money on teeth whitening products. Teeth whitening products have become an 11 billion-dollar industry, but the Teeth Whitening Tips app will introduce you to whitening recipes you can easily make at home. Download Teeth Whitening Tips, and expand your knowledge with easy ways to make your teeth brighter. As you can see, there are a lot of useful ways to use the Dental Anywhere app. If dental appointments are a frequent occurrence in your family, consider downloading the Dental Anywhere app on your mobile device. Truly unique and offering multiple functions, the Tooth Brushing Motivator & Mental Trainer is an innovative app for your smartphone. In addition to a revolutionary system that guides you to brushing each individual tooth, the app also features a mental trainer. The mental trainer takes the user through a Chi Gong mouth rinsing exercise that is beneficial for both relaxation and dental care. Combining originality with functionality, this is a fun and innovative dental app for your smart phone. What if you could gather all of your best friends and brush your teeth together at night? With Beam Dental, you can do just that. Turning oral care into a social event, the Beam Dental app joins you with others who are brushing. The app also features games, colorful screens, photos, and the ability to find a nearby dentist at any time. With the Beam Dental app, you’ll never have to brush alone again. 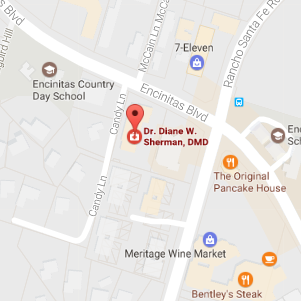 Visit Dr. Diane W. Sherman and Keep Your Oral Care on Point! The more fun you can make your brushing experience, the more often you’re likely to brush, but home oral hygiene is only one piece of the puzzle. The other half of oral hygiene involves visiting your dentist every six months for regular checkups. These appointments are vital for examining for dental problems, finding oral cancer early, and ensuring that your teeth are properly cared for. Dr. Sherman takes pride in restoring her patients smiles. Contact Diane W. Sherman, DMD to set up an appointment today.